Developer: New Star Games Ltd.
It’s not easy to make a living in the soccer business these days, tax collectors keeping a sharp eye on star player’s salaries and brokers and referees can’t enjoy a fancy dinner without being accused of match fixing .Those same brokers aren’t allowed to keep a collection of the boxes of expensive watches in a secret drawer without being accused of corruption. That’s why we’ll keep our experience in the world of soccer on the digital side. New Star Manager has been developed by New Star Games Ltd. and published by Five Aces Publishing Ltd. for PC and mobile. Sometimes all a team needs is some fresh blood leading them to get them out of the gutter. 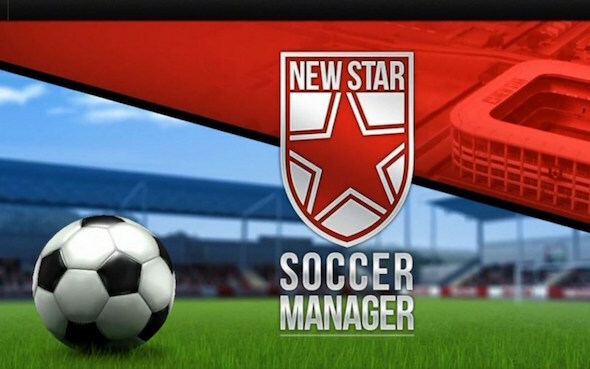 In New Star Manager you take control of a small club called New Star FC. The club is near the bottom of the classifications with only a few matches left in the season. Your assistant manager, Simon Read, will get you up to speed on the current state of affairs, morale is low and funds are tight. The board of the club managed to scrape together twenty eight thousand coins to get you started. Not everyone is lucky enough to get a small loan of a million dollars to get started. 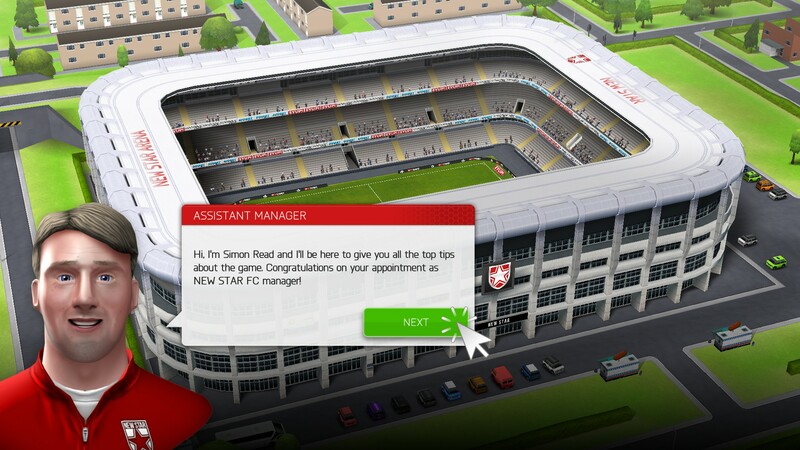 During the initial season ,which counts as a tutorial, you will get a lot of interaction with your assistant manager. Later on in the game he’ll take more of a backseat position. Your progress in the story is nicely integrated with the flow of the matches, the team and fans will send little messages, much like tweets to your screen informing you game related information as well as small tidbits of information such as announcing the birthday of a player. The press will also help drive the story in the form of articles and interviews. So you get a very steady constant stream of small story bits without realizing it. New Star Manager sports a cartoony look, nice and crisp. This is to keep system requirements low and the look and feel consistent on all supported hardware such as mobile devices. The graphics look great, the cartoony style gives the game an arcade feel while under the hood it is very extensive. 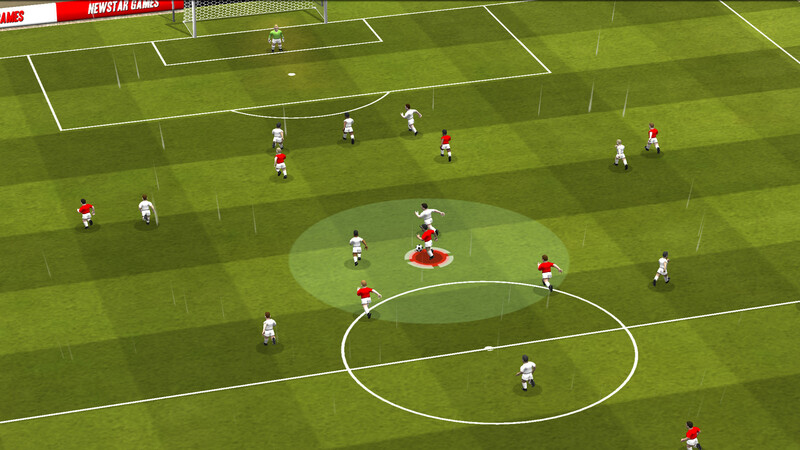 The visuals themselves are consistent, upgrades to your stadium made on the world map are also visible during a match. A small negative point is that during a match, all players of your team look alike while they have different statistics. This could lead to you passing the ball and wanting to dribble with the player with the lowest dribble skill. When watching a match on TV you can always clearly spot the Messis and Ronaldos from a mile away. This could help build more of a relationship with your team, now selling a team member has little to no emotional value. The game has vivid soccer sounds and an upbeat soundtrack to match the cartoony visual style. The sound does a good job in supporting the game overall with good sounds effects of crowds booing and cheering as well as general ambient sounds that help you keep track of what is going on in the game and more specifically during the actual matches. New Star Manager is a soccer management simulator, in which you control every aspect of running a soccer club on a day-to-day basis. This includes, but is not limited to, actually playing matches and scoring goals, upgrading your stadium and training ground, managing staff, dealing with sponsors, the press and most of all the board of directors. The fans, the board, the sponsors and the press are the four cornerstones by which you can measure how well the club is doing at any given time. Plenty of information and statistics can be found in game for each of them, please them and you will be rewarded, ignore them and face the consequences. When you start the game you have a small field with very little room for fans to come see the matches, your stadium is lovingly called the pool of mud. You need coins and you have several ways to gain these coins. A small amount will come from the fans who pay to come see the matches, the board will provide some and later on when you have sponsors they will also bring in coins. There are plenty of things to spend those coins on as you need to upgrade your accommodations, hire staff and do some promotional stuff. This part of the game can best be compared with any management sim out there that has you running a theme park or a hotel or any business for that matter. Now let’s move on to the team. You have your players and staff and they will be working in buildings such as the training center. These staff members will generate cards that you can use on your soccer team. Some cards affect individual members such as a card to increase their strength while others can provide a boost to the entire team during half time such as the pep talk card. With this card, a small mini game will occur, allowing you to boost you team’s morale. Failing it has no negative consequences. Last but not least is playing a match. 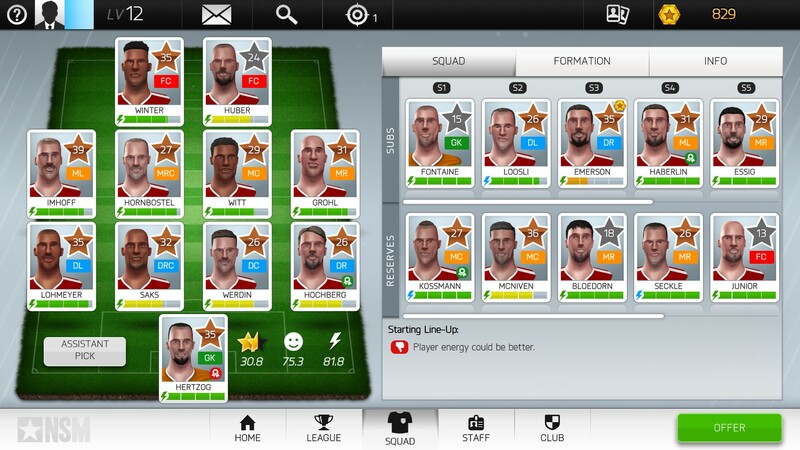 This is the only real way to improve your team’s rating and your clubs prestige. Before each match you get to decide who you bring to the field and what formation your team will be playing in. You can have your first trainer pick a line-up for you because this requires some micro managing as players do have several stats themselves that might cause them to perform subpar, like injuries, fatigue or downright diva moments. During the match you can adjust focus, like offense, defence or counter. At certain times you get to control your team yourself. This is done solely with the mouse and controls are easy to learn but hard to master. Clicking a team member without the ball will initiate a pass, clicking and dragging a player will tell him to start running in that direction and finally, holding down on the player with the ball will make him start dribbling and releasing will let him kick the ball towards the goal. Upon release you get the change to put a little spin on the kick. The controls work well but take some time to master. New Star Manager is a very enjoyable game, even for non soccer fans. Do not let the cartoony look fool you, the game has a lot of depth to it. The match controls are straightforward but executing them correctly might take some time to master. With only minor negative points this is a game that can be enjoyed by all ages, be it on PC or mobile.